Literature has done so many things for me. In all honesty, I think one of the most wonderful things it has accomplished has been the soothing and molding of my heart into that of a lady; or, at least, wanting to be more of a lady. On a daily basis, I read about the most courageous, gracious, brave, decided, meek, loving, gentle, and amiable heroines that are to be found, and being in their beautiful presence has made me want to become them. As a young woman in an increasingly individualistic society, I have seen what our world impresses upon myself and upon young women of my acquaintance. If you look at some of the female characters in some of today’s pop culture, a large chunk of them can be loud, brash, buxom, and merely promiscuous plot devices (mind you, I don’t say all in pop culture—the women of Wakanda, the Black Widow, and Captain Marvel have my fondest admiration). However, I have been pondering, for myself, on the traits and characteristics of a lady. Reading books like Pride and Prejudice, Jane Eyre, Persuasion, North and South, and Agnes Grey makes me see that I am becoming or will become like the heroines I read about. Watching films like The Sound of Music, My Fair Lady, or Downton Abbey (which is actually a series on ITV) does the exact same thing! When I see the women speak, hold themselves, express themselves, and go about their daily lives, it makes me want to imitate their ways. Full of grace, cautiousness, tranquility, elegance, yet never expecting perfection of themselves. It presents me with a choice: the choice to become a lovely young lady. And so I mean to do! In this post, I wanted to take the opportunity to discuss the most prominent characteristics of five of my favorite literary/cinema ladies and elaborate upon what makes each of them so special to me. I also want to discuss why they make me want to be a lady, and why women everywhere should embrace their womanliness. 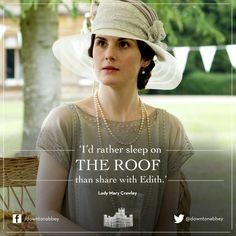 I wanted to start off my discussion of ladies by introducing Lady Mary Crawley, the eldest daughter of Robert Crawley, the Earl of Grantham. Because she is the eldest of two sisters (Edith and Sybil), so much is expected of Mary. Mary herself first comes off as a very snobbish character. She is very hard towards her sisters (mostly Edith), and she acts superior to them. The standards her parents and her society set for her are extremely high, and thus she puts on an air of superiority to play it better. However, in the first season of the show, Mary is confronted by sexual temptation, and when she succumbs to it, she realizes that she is not as perfect as she thought she was. This makes her harder towards her sisters, more secretive with her father (who is one of the characters still in the dark about her sin), and she fights bitterness constantly. During the first two seasons, Mary is a completely depressed character. She has no avenue to be loved through, and her humanity shows out strongly. She is only her true self when she is alone. For the rest of her world, she comes off as a perfectionist. As the audience, we are the only ones who see Mary’s true heart. Honestly, if we couldn’t see her true emotions in the quiet of her bedroom, she would come off as a cold and heartless woman. If Mary has taught me anything about being a lovely woman, it’s been her flaws that have made her most memorable. As the audience, we long for her to express her true feelings, to share her dark moments, and to ask for help. When she carries the burden of perfection all on her own, we cry with her, and we want to go alongside her. Mary is a strong woman, but what makes her so memorable is her emotions. To be a lovely woman, you don’t have to be perfect, and this is something Mary learns as the show goes on. You don’t have to muffle your emotions under a blanket of perfection. It’s okay to weep, it’s okay to feel anger, and there’s nothing wrong with being annoyed (as Mary often can be). No one will ever be free of humanity’s vices, and it’s normal to wrestle with them. In short, you don’t have to be perfect to be a lady. 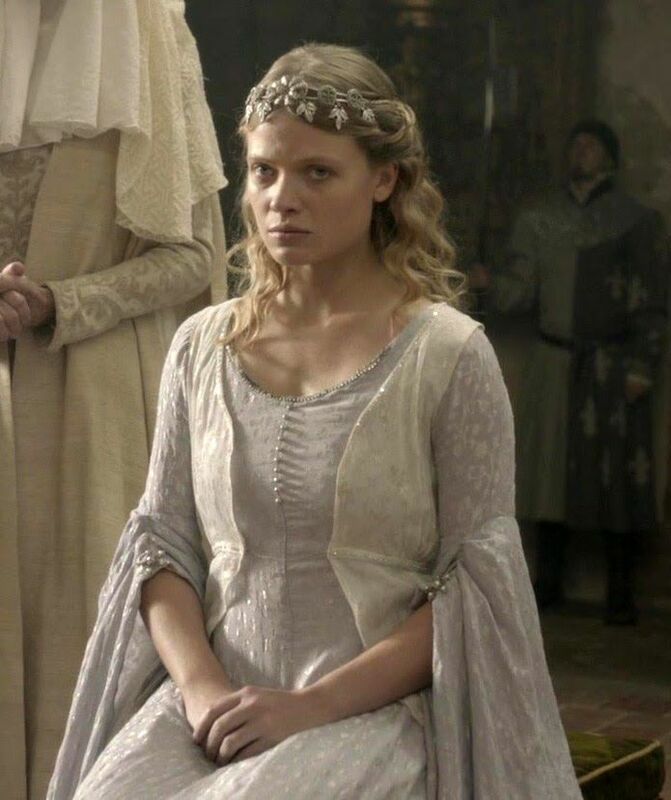 One of the most memorable moments of reading Shakespeare’s Henry V and watching BBC’s The Hollow Crown is the moment when King Henry woos the French princess, Katharine of Valois. First, she is the only character (besides her nurse who is with her) to deliver an entire scene speaking in French. Why do I argue this as being a proof of her innocent nature? Well, consider the other French characters in the play: they all speak in English with a few French phrases thrown in to keep it real. The princess, on the other hand, has an entire scene spoken in French. Shakespeare was a smart writer. By making the princess speak mostly French and be unable to speak sufficient English without the help of her nurse, Shakespeare makes her look like a child. She holds herself well enough to not be a child, and yet she still holds a childlike attitude in everything she does. The way she says things in English also makes her look like a child. For example, instead of saying “I can’t speak English,” she says “I cannot speak your England.” It’s rather comical reading and watching her and Henry interact, but her French and his English make it a memorable moment. This brings me to my second reason for advocating Katharine’s innocence. When she finally decides to accept Henry’s proposal of marriage, he takes her hand, intending to kiss it and call her his queen. Naturally, Katharine startles, begs him to let go, and says she would not have him lower himself by kissing the hand of someone lesser than he. In turn, Henry says he’ll kiss her on the lips instead, to which Katharine further objects. She kindly but firmly lets him know that it’s not the custom in France for men and ladies to kiss before they are married. Of course, to make it a perfect ending, Henry gets his kiss, but Katharine’s whole attitude towards his advances is what makes her innocent nature so memorable. Not only is she reluctant to kiss a man who professes his love for her, but she means to keep herself confined to the customs of her people: once again going back to the French-speaking argument. She wants to remain innocent, even in her love for Henry. If Katharine has taught me anything about how to be a lady, it’s been to remind me of a lady’s innocence. I couldn’t write a post about being a lady without making some kind of reference to Julie Andrews, my make-believe British grandmother. I recently re-watched Rodgers and Hammerstein’s The Sound of Music, and the movie once again swept me away, and I have not stopped singing the soundtrack. 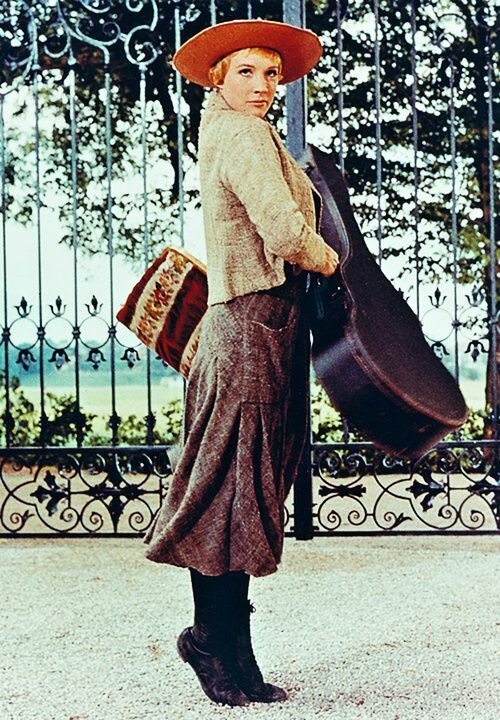 Without doubt, Maria von Trapp, the main protagonist in the musical, is definitely a lady I aspire to be. She is witty, enthusiastic, graceful, honest, but her most prominent characteristic is expressiveness. Maria is not afraid to speak her mind, share her feelings, or spread her contagious joy. One of the first songs in the film is sung by the nuns of the abbey at which Maria herself is a nun, and in which they are complaining about her constant expressive nature. “She climbs a tree and scrapes her knee, her dress has got a tear. She waltzes on her way to mass and whistles on the stair. And underneath her wimple, she has curlers in her hair!” The nuns can’t stand Maria’s constant bounciness, enthusiasm, and vigor. Once Maria leaves the abbey, she feels free to be herself and free to express herself through song. She brings this attitude to the von Trapp children, to whom she has been sent to be their governess. This contagious philosophy of hers spreads even beyond the children: to their widowed father, a captain who later falls in love with Maria. One of the most expressive parts of the film is actually when Maria and the Captain dance the Ländler. Without being verbal, this is the moment in the film where they both realize they love one another and where they both express it. It’s plain to see how expressive they both are of their love by observing the movements of the dance, the placing of the hands, the glances of the eyes, and the smiles playing around on both of their faces. I think that is very expressive! That’s why I’ve labelled it the best dance scene from any movie (even more than Elizabeth and Darcy’s from Pride and Prejudice). Her expressiveness transfers over to him in this scene, and she realizes that they both feel the same way. Throughout Maria’s screen time, you can see in her a woman with a lot to say. She wants her feelings, ideas, emotions, and encouragement to be well known, and she is never afraid to express herself. If Maria has taught me anything about how to be a lady, it’s that a lady should never be afraid to express herself. “Do you think I can stay to become nothing to you? Do you think I am an automaton?—a machine without feelings? and can bear to have my morsel of bread snatched from my lips, and my drop of living water dashed from my cup? Do you think, because I am poor, obscure, plain, and little, I am soulless and heartless? You think wrong!—I have as much soul as you—and full as much heart! Jane Eyre remains one of my favorite novels of all time, and not strictly because it was a Victorian Gothic thriller, but because of the level head and firm mind of the eponymous protagonist: Jane Eyre. Jane, from the beginning of the story, is a girl of good decisions. Jane, from an early age, possesses a strong faith and can easily determine the difference between good and evil. Because of her upbringing under her cruel aunt, Mrs. Reed, she wants to be a good in the world to balance out the scales (be it ever so lightly), in which evil seems to be trending. Throughout the story, Jane is confronted with multiple decisions, ultimately leading up to her decision to flee Thornfield Hall after learning that her fiancée is already secretly married to a lunatic who hates him. What makes Jane such a memorable character is her firm, decisive, and true personality. She knows what’s right and true, and no one will tell her otherwise. She is no better or no lesser than others, she sees what must be done when a decision needs to be made, and she is never afraid to make morally good decisions, no matter how much it will hurt her or those around her. Even when she finds herself madly in love with Mr. Rochester, she has to make the difficult decision to leave him on the brink of their marriage when she learns that he has already been secretly married to a psychotic, violent, and insane woman that never loved him. If Jane Eyre has taught me anything about how to be a lady, it’s that a lady always makes morally good choices, no matter how it will affect her or those around her. To end this lovely post, I wanted to discuss my newest edition to literary ladies: Margaret Hale. I just finished Gaskell’s North and South, and I absolutely loved the ending. I’m hoping to write a spotlight post on it before the year ends. It was a marvelous book. Anyways, the heroine of the story, Margaret Hale, is a distinguished young woman. She can be a bit high-and-mighty at times, especially with Mr. Thornton (who is an awesome albeit self-made individual). What highlights Margaret, though, is her heart for those who are in need. Throughout the story, Margaret is always looking to help those who need her. She befriends the young Bessy Higgins, a girl Margaret’s age whose illness has been caused by the industrial revolution. She also comes alongside the families who work in the factory, to provide comfort, food, and spiritual support. Margaret shows compassion on all of them, accept Mr. Thornton, who she blames. She chooses not to see him as someone who is suffering just as much as they…but more on that in the upcoming spotlight post. Margaret cares for others, and her attitude reminds me of what Charles Dickens wrote in his A Christmas Carol: “to think of people below them as if they really were fellow-passengers to the grave, and not another race of creatures bound on other journeys.” This is Margaret’s attitude entirely for her poor friends and impoverished neighbors. If Margaret has taught me anything about how to be a lady, it’s that a lady cares for people in need, be they poor, rich, or wanting in any aspect. As I learn from these wonderful ladies, they make me want to become a graceful woman myself. I hope I have encouraged you, my female readers, to strive after the attitudes of these lovely women. Ladies don’t have to be perfect, but are called to love, care for, encourage, express, decide, and remain innocent. Young lovely ladies of the world unite!